World War I ended with the peace treaty signing called the Treaty of Versailles. Within this treaty, the victors asked for unreasonable demands. Some of these demands include putting all the blame of this war on Germany, dividing the land up, occupying the lands rich of iron and coal, restriction on Germany’s future army size and even ask for astronomical reparations reaching between $33 billion to $56 billion. Wilson initially wanted to this to be a peace treaty that ended future wars, but with such demands, anger and frustration was bound to lead into another war. The only thing good that came out of this treaty in Wilson’s eyes was the League of Nations. Foner’s description of the Treaty of Versailles was well made but seemed a bit vague. It didn’t seem like it completely covered all aspects of this treaty. Foner confirmed my knowledge of this history in that this treaty was unjust and over demanding. 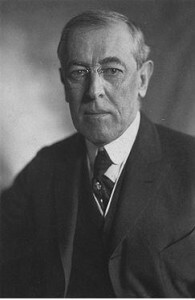 Republican candidate Woodrow Wilson was elected as the new President in 1913. The former governor of New Jersey won a staggering 42 percent of the popular vote, beating out Teddy Roosevelt and Howard Taft in rankings, who had 27% and 23% respectively. Wilson set up regular press conferences to inform the public on issues of legislation and to try to raise the publics’ opinion of him. He also personally delivered messages to congress believing that it was more noble that writing them on a piece of paper. He passed the Underwood tariff which vastly reduced tariffs on imported goods, and also implemented an income tax of the richest 5% of Americans. He also passed the Clayton act of 1914 which “exempted labor unions from antitrust laws”. To help out the lower and middle classes, Wilson also passed the Keating-Owen Act which outlawed child labor; the Adamson Act which created an 8 hour work day on all American railroads, and the Warehouse Act which gave credit to farmers who stored their crops in federally licensed warehouses.